It's fair to say that I bake a lot more cookies than I eat. Usually, the fun is in the baking and the sharing. These cookies are different. I first tried this recipe when it appeared in Living magazine, and it became a favorite of mine. I typed it into my file, with one small change, and kept it for future use. My little change was to increase the amount of whole wheat flour to 3/4 cup to bring the dough together a bit more. Something I wouldn't change is the use of natural peanut butter. Most recipes assume regular, sugary, hydrogenated oil-filled peanut butter will be used, and when I use natural instead I have guess at the right amount of sugar and make other alterations. It's so rare, but fantastic, to see real peanut butter used. 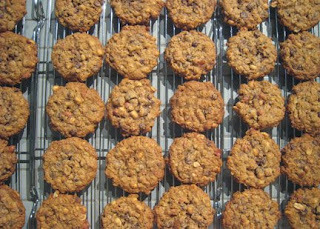 This weekend I purchased a copy of the new Martha Stewart's Cookies book and was delighted to find the recipe included in it. Apparently, everyone at MSLO knew it was a keeper too. I baked a batch yesterday, put several in the freezer to enjoy as needed, and brought a few to work to share. Kurt completely disagrees with me about the use of peanut butter in baked goods. He gave this cookie a seven out of ten after eating four of them and claims to only ever want chocolate chip. No matter, this is a cookie I enjoy eating as much as baking. We’ve had our loquat tree for four years or so, and every year the birds get to eat the fruit before I do. However, thanks to last year’s abundant rain, we had more loquats than ever this year, and I finally got to harvest some. 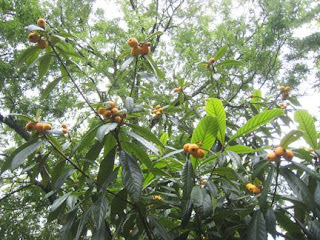 The loquat (Eriobotrya japonica) lives in our backyard with several palms, bananas, ferns, and bamboo plants. It’s evergreen and blooms in the fall and winter so that the fruit is ripe in the spring. Picking the fruit and cooking with it was very exciting because I’ve looked forward to doing so since my first taste of loquat. 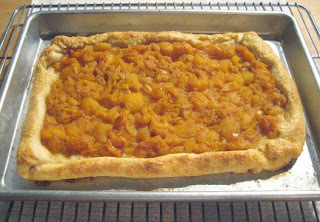 On a trip to Bermuda in 2002, my dessert one evening was goat cheese-cheesecake with loquat jam. Since then, knowing that loquats grow easily in Austin, I’ve been hoping to grow my own and cook with them. Maybe this isn’t exciting for those who have lived with loquat trees their whole lives, but it’s a warm climate delight for me. They were very easy to peel, and the seeds popped out with no problem. I cooked them down with a little water and honey. They didn’t thicken as quickly as apricots, so I assume they have less pectin. Their flavor is mild; not too sweet and not too tart. At last, I had my very own loquats in a tart of my making. In hindsight, the look of the tart would have been improved by a few carefully placed raspberries on top. To speed up the cooking process, I used a trick I learned from Ina Garten: In a heat-proof bowl, pour enough boiling water to cover by two inches over dried split peas. Let sit 15 minutes or longer while prepping the other ingredients and drain. Heat olive oil over medium high flame in a five quart pot or larger, and add Aleppo pepper, chopped onion, and a teaspoon of salt. Saute until onion is translucent. Add split peas and broth and bring to a boil, reduce heat, and simmer for 30 minutes. If you choose to forego the speeding up process mentioned above, the simmer time is at least an hour. When the split peas have transformed themselves into tender little, fully cooked, wonders, add the greens and season with salt and black pepper. 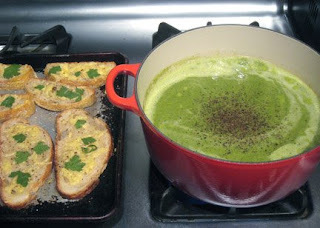 Stir the greens into the soup and let simmer another five minutes. Transfer soup to a blender pitcher and puree in small batches. Pureed soup should be transferred back to a separate, clean pot, reheated, and checked for seasoning. This is the point in recipes at which the cook is cautioned about the dangers of pureeing a hot liquid in a blender. Even with small batches, the steam rises as soon as the blender is turned on, the lid will fly off, and your soup will explode all over your kitchen. You need to hold down the lid with a towel, and quickly pulse the blender on and off until the steam has dissipated. One way to avoid this issue entirely is to let the soup cool a bit before pureeing. After many years of soup making and many recipes requiring this step, I had always managed to avoid any soup explosions from my blender—until last night. Maybe I was in too much of a hurry, maybe I put a little too much in the blender, or maybe I had developed a false sense of confidence in my pureeing of hot liquids skills. The first batch indeed exploded, hot liquid blew forth from the blender pitcher, scalding my forearm and chin, and left the countertop and floor covered with chunky split pea soup. A few dirty towels later, the soup was finished, seasoning was corrected while it re-heated, and all was well. Kurt made some comment about ‘where’s the pork belly,’ but he was actually very happy with this near-vegetarian soup. 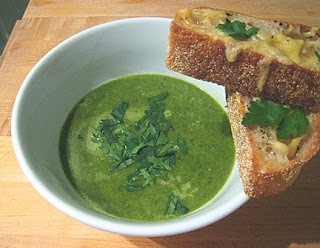 Each serving was topped with homegrown parsley and a drizzle of olive oil. This simple combination of a few ingredients was very satisfying. This experiment might have had more to do with testing baking equipment than a recipe, but I learned something about both. For years, I had been using a couple of trusty non-stick, air-layered cookie sheets, but they had gotten a little bent and weren’t as non-stick as they used to be. 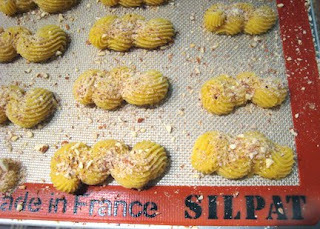 Also, I thought I might be the only person on the planet who hadn’t baked with a silpat. So, when I received a Williams-Sonoma gift card for my birthday, I headed straight to the cookie sheet area of the store. I bought one half sheet pan and a silpat to fit it. I thought I should test this before purchasing more than one. With my batterie de cuisine now expanded, it was time to try a corn flour cookie I had been craving. I was imagining a crunchy cookie that would hold its shape. Instead, the cookies spread while baking and definitely lacked crunch. I was not thrilled with the result of the recipe test, but the silpat worked beautifully. I plan to purchase a few more with pans of the same size. Now, since Kurt had no preconceived notion of what this cookie could or should be, he was very happy with the result. 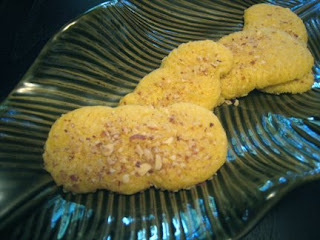 He enjoyed the chewy texture with the lemon flavor and the crunch of the chopped almonds on top. When I peeked in the oven and saw the cookies spreading, I thought I should have chilled them before baking. Since they all fit on one pan, I didn't get to test that theory. Given the fat content in the recipe, that probably wouldn’t have helped much anyway. Also, a little longer baking time would have resulted in a drier cookie, but this wasn’t the right recipe for my particular craving. I’ll just have to try again. A couple of friends joined us for brunch yesterday, and I had the opportunity to experiment with some alternative flours. 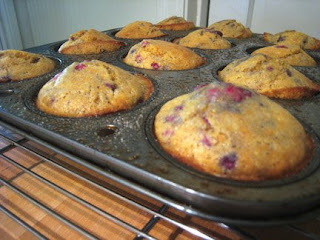 This recipe came from Epicurious, and the only changes I made were using raspberries instead of blueberries and turbinado sugar instead of granulated. 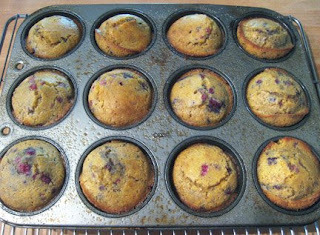 The muffins turned out great, there was no issue with them rising, and the texture was like that of muffins with wheat flour. They were enjoyed by all. Brunch also included veggies from Walnut Creek Organic Farms. This was our first week receiving a share with their CSA program. So far so good.